Sherrardspark Wood sits within the green belt that separates Welwyn Garden City and Welwyn village, to the West. Sherrardspark Wood Wardens’ Society is an independent voluntary group helping to care for the woods in accordance with the management plan of Welwyn Hatfield Borough Council (WHBC), which has been agreed with Natural England and the Forestry Commission with a view to keeping this Site of Special Scientific Interest in favourable condition. Work parties take place on both Thursday and S unday and more than 20 members regularly attend. The Society puts much time and effort into the work it undertakes not only in Sherrardspark Wood but also when helping volunteers at other sites in the district. 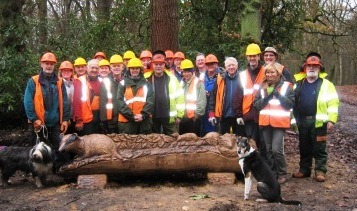 A group of Wood Wardens regulary attends the work parties organised on the third Thursday each month by the Friends of Danesbury Local Nature Reserve in Welwyn, where they are currently much involved in the work on the Danesbury Park Fernery Restoration Project. The Wood Wardens also provide regular support to the Friends of Mardley Heath who meet on the third Sunday every month.. The year 2006 saw the Wood Wardens 40th year anniversary. This was celebrated with an excellent picnic in Sherrardspark Wood and a Wood Wardens’ commemorative bench was erected at Six Ways, a meeting of 6 paths within the wood. The wood wardens enjoy the social camaraderie that has been generated within its membership, and in 2011 a Wood Wardens’ Walking Group was formed which offers a monthly walk rounded off by a pub lunch. 2016 will be the Wood Wardens 50th anniversary and a busy Programme has been arranged. The 2016 Programme can be found on the WPAG Events Calendar. But for full details of the Wood Wardens Society and all their many activities, go to the Sherrardspark Wood Wardens website.